It's official. The largest and most influential mixed martial arts promotion company in the world is coming to town. In an article posted on its official website, the Ultimate Fighting Championship or UFC announced that it will be staging an event dubbed UFC Fight Night Manila on May 16, 2015 at the Mall of Asia Arena in Pasay City. This will be the first time that the UFC stages an event in the country. It's also the first UFC event in Asia this year. In recent years, the company has been flexing its muscles to attract MMA fans in Asia. So far, the company has staged events in three territories - Japan, Singapore, and Macau. 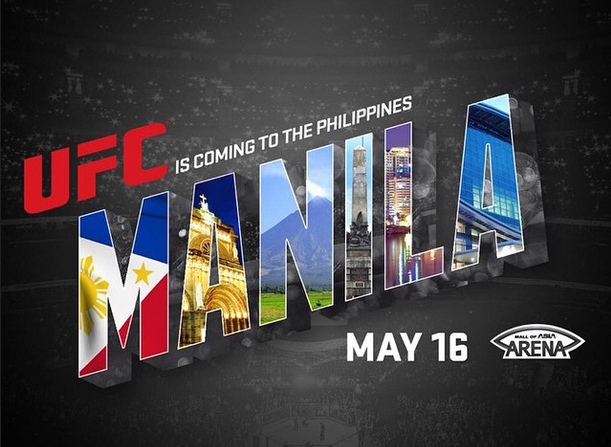 The Philippines will be the fourth Asian country to ever host a UFC event. The UFC is yet to announce who will be fighting in the event but according to the company, it has nearly 40 Asian fighters in its roster. And because UFC Fight Night Manila is an Asian event, it's expected to feature mostly fighters of Asian origins in the fight card. Fighters with Filipino roots like Mark Munoz, Robbie Lawler, John Dodson, and Chris Cariaso come to mind. There's also a handful of local fighters who once or twice saw action in the Octagon who might be tapped to fight in the card. There's Mark Eddiva who has one win and one loss in the UFC. And then there's Roldan Sangcha-an and Dave Galera, two local MMA artists who had one fight each under the UFC banner. Although both of them lost their respective bouts, the company might tap them for the event. Photo from the Ultimate Fighting Championship's Instagram page. Mark Munoz who goes by the nickname "The Filipino Wrecking Machine" will most likely be in the card as he is one of the most recognizable Filipinos in the UFC. Munoz is currently ranked number 14 in the UFC's middleweight division. He used to be in the top ten but after back to back losses to Lyoto Machida and Gegard Mousasi, his ranking slipped down as well. The division is currently ruled by Chris Weidman, a man Munoz fought and lost to in 2012. Robbie Lawler, the current UFC welterweight champion is half-Filipino but it's unlikely that the company will bring him to the Philippines. Lawler is one of the UFC's biggest stars and the company isn't foolish enough to waste the fighter's drawing power to a Fight Night event that isn't being held in the United States. And then there's Mark Eddiva and Roldan Sangcha-an. There's a huge possibility that these two fighters will appear in the card. One, they are homegrown fighters and they've had previous experience appearing in UFC cards. Eddiva fought in the UFC twice last year and went 1-1. He defeated Jumabieke Tuerxun in Macau during his debut. In his second UFC outing, Eddiva flew to Brazil and engaged Edimilson Souza in a fight of the night tussle. He lost the bout via TKO in the second stanza. Eddiva was then tapped to appear in another UFC event in Australia but he had to pull out due to an injury. Sangcha-an on the other hand entered the Octagon undefeated in June 2014 in the undercard of Te Huna vs. Marquardt. He lost the fight to Richie Vaculik via unanimous decision. It's also likely that the event will feature fighters from other Asian countries. There's Takeya Mizugaki, a top ten ranked fighter from Japan in the bantamweight division. And then there's Dong Hyun Kim, a fighter from South Korea who has legions of fans in the Philippines. UFC Fight Night Manila will happen at the Mall of Asia Arena in Pasay City on May 16, 2015. According to the company's announcement, tickets for the event will start selling sometime in March.